At a time when businesses have access to more data ‒ from more sources ‒ than ever before, Mina Lux believes the ability to better understand that information will be crucial to future success. That’s precisely the challenge that Lux, who just took home the Gold Stevie Award in the 2016 Stevie Awards for Women in Business for Female Entrepreneur of the Year, is trying to address. 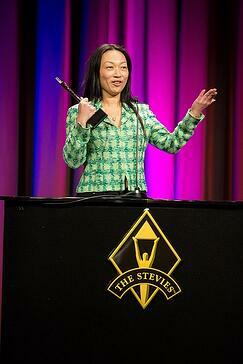 The 2017 Stevie Awards for Women in Business will open for entries on May 22. These are the top awards for women across the globe. 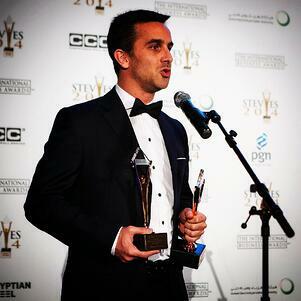 The program features entrepreneur awards, company awards, marketing awards, media awards, and more. Request the entry kit now and it will be emailed to you in May. Her young New York City-based firm, Meelo Logic, Inc., enables companies to aggregate data and gain insights through artificial intelligence. As a result, clients can “understand, activate, engage and motivate customers” more effectively. It’s an endeavor that could fundamentally reshape the way companies interact with data. And yet the Taiwan native, who grew up in Canada, has an even more ambitious goal: to break down the longstanding gender gap within the tech industry. She’s trying to tackle the issue by mentoring young females and calling attention to the issue at industry events. “Throughout my career, I’ve had the good fortune of supporting young women in their careers by offering them guidance and opportunities in organizations that are often dominated by men,” Lux says. The under-representation of women is underscored by a 2015 TechCrunch report, which found that only 18% of technology companies had a female founder. That’s up from less than 10% as recently as 2009. The forces behind that phenomenon are numerous. But for Lux and other women in the industry, there’s still plenty of work to do. Certainly, having fewer female role models to follow has kept many young women from studying in computer science or engineering programs. Those who do pursue STEM-related degrees often find unique obstacles when they try to launch startups of their own. In part that’s because early-stage investment firms are themselves a “boy’s club,” according to researchers. A joint survey by the National Venture Capital Association and Deloitte, for example, found that women make up just 11% of top decision-makers at venture capital firms. And, there are plenty of entrepreneurs who say that creates a bias ‒ whether consciously or not ‒ against female-led organizations. To overcome those hurdles, Lux suggests it’s important for females to not only have the necessary skills, but the confidence to see their goals through. It’s a point she drove home during an International Women’s Day event at her alma mater, the University of Ottawa. Cracking the glass ceiling is something Lux has successfully done time and again. After graduating with a dual biochemistry and chemical engineering degree, she changed course and helped co-found a marketing company called FloNetwork. There, she pioneered the first technology platform that allowed businesses to send emails as a way of generating leads and building revenue. She ended up selling the business to DoubleClick for a staggering $80 million in 2001. After a distinguished consulting career where she tackled digital marketing for the likes of USA Today and Doubleday Book Club, she decided to start a new technology firm that would help businesses strategize based on real-time consumer data and behaviour prediction. Meelo was born. Already, the company is gaining serious attention from the tech world. Among its accomplishments: beating out thousands of early-stage firms to win the 2016 TiE50 Top Startup award. “[Meelo] is the only company that holds partnerships with the two largest think tanks in the cognitive technology and artificial intelligence: IBM Watson and Caltech/Jet Propulsion Labs,” Lux explains. “Meelo uses both think tanks to solve any problem and provide intelligence for any need." In order to deploy the technology effectively, she says it’s vital that the organization bring in contributions from a diverse pool of talent.